Clickstream is the largest data set at zulily. As mentioned in zulily’s big data platform we store all our data in Google cloud storage and use Hadoop cluster in Google Compute Engine to process it. Our data size has been growing at a significant pace, this required us to reevaluate our design. The dataset that was growing fastest was our clickstream dataset. We had to make a decision to either increase the size of cluster drastically or try something new. We came across Cloud Dataflow and started evaluating it as an alternative. 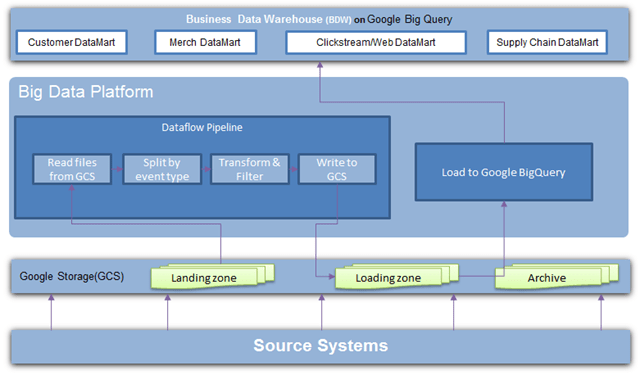 Why did we move clickstream processing to Cloud Dataflow? Clickstream data processing did not require complex correlations and joins which are a must in some of the other datasets – this made the transition easy. Most importantly, we have always thought about our data processing clusters as transient entities, which meant dropping another entity in this case Cloud Dataflow which was different from Hadoop was not a big deal. Our data would still reside in GCS and we could still use clickstream data from Hadoop cluster where required. One of the core principles of our clickstream system is to be self serviceable. In short, teams can start recording new types of events anytime by just registering a schema to our service. Clickstream events are pushed to our data platform through our real-time system(more later) and through log shipping to GCS. Store the data back into GCS, which is our central data store but also for use from other Hadoop processes and loading to Big query. The next step for us is to identify other scenarios which are a good fit to transition to Cloud Dataflow, which have similar characteristics to clickstream – high volume, unstructured data not requiring heavy correlation with other data sets.